The holidays are a special time when friends and family come together to celebrate giving thanks, being together, and spreading holiday cheer. 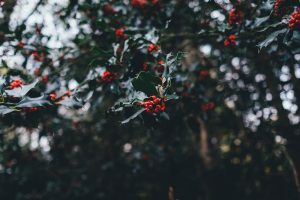 While one fun way to get into the holiday spirit is by decorating your house with lights, candles, and greenery, it can also be stressful to get the look just right. 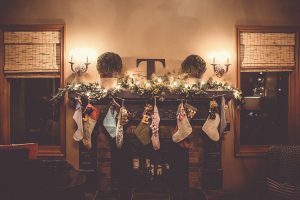 All too often, we find ourselves rushing around, buying last minute items, and stressing out about decorating the home. To help keep your focus on what matters most, try out these simple yet festive decorating ideas that will make your friends and family say ooh and ahh! Not only are these decorating ideas fun and cheerful, but they also take less time than wrapping your presents. What’s the theme of your home? Instead of creating an entirely new look for the holidays, work with what you already have in your house. Not only will you save money by not buying new decorations, but you won’t have to pack them away for eleven months of the year. Try arranging a wintery bouquet in an old watering can—the look gives off a rustic, yet festive feel to any room. We all miss the flowers and colors of spring and summer, but winter is fabulous for fragrant greenery! Head outside with a pair of shears and snip some greenery from your yard to use for decorating around your house. Try spreading out your clippings by attaching it to gifts, or tuck a spring of pine on a festive pillow. We won’t tell if you accidentally end up in your neighbor’s yard! Who doesn’t love a striped candy cane or sweet piece of chocolate? Holiday candy not only tastes delicious but also looks gorgeous placed elegantly around the house. 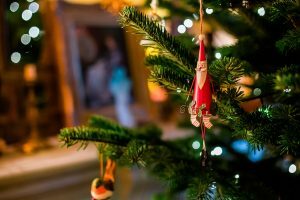 Try hanging candy canes in tinsel running down the banister of your stairs, or try placing handfuls of green and red colored candies in bowls to munch on. It’s always fun to indulge in an unexpected sweet treat. We firmly believe that ornaments aren’t just meant to be hung on the Christmas tree. With all the different shapes, sizes, and colors, ornaments are the perfect decorating tools to add cheer to every room. Have an empty glass vase? Fill it up with ornaments. It will look great on your dinner table or mantel. Just be careful when the kids are playing, we don’t want any broken glass! Adding holiday decor to your chandeliers or lights is an easy way to pump up the cheer. Have extra greenery lying around from your outdoor clippings? Try to gently drape it around your chandelier. With the lights dimmed at night, the greenery gives off an elegant and festive mood for the holiday. Similar to ornaments, garland can be made of anything your heart desires and can be used anywhere around the house to add festiveness. Our favorite place to add garland is over the fireplace. A traditional string of cranberries is the perfect addition to a classic mantel. Want an elegant look? Try shimmery silver and gold garland. The final touch? A hanging glass ornament in the middle—it’s the perfect scene above a warm fire. Candlesticks are the perfect additions to a festive dining room table. With the lights dimmed, candles give off an elegant feel at mealtime. Swap out your plain beige candlesticks with wintery green, ruby red, or sparkly silver. Match them to your table linens, or have them as your statement piece—whatever you choose, your guests will love the holiday cheer. On Christmas morning, all eyes are on what’s under the tree. While it’s fun to look forward to opening gifts, why not wrap your gifts with a festive theme to add to your home decor. Our motto is, the more the merrier—so whip out the glitter and the scissors and get wrapping. There’s no such thing as overdoing big bows and fun wrapping paper on Christmas! No one likes to decorate the house alone. Do-it-yourself crafting is the perfect excuse to get your friends and family together to get into the holiday spirit. Invite them over for a warm mug of hot cocoa and pick your favorite holiday craft to make together. Try painting plain white ornaments, or make a festive wreath. Just don’t forget to have sweet treats on the table for your guests! Above all else, the holidays are about giving back. Whether you bake and decorate Christmas cookies to give to your neighbor or take your family to help out at your local shelter, it’s imperative to recognize that this is the season for giving. 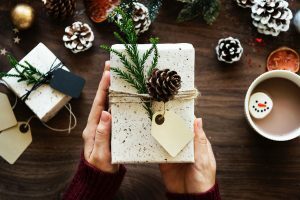 Although the holiday season is a busy time filled with cheer and joy, it’s also the perfect time to start thinking about your goals for the New Year. Thinking about selling your home in Toledo? After the holidays is a great time to start prepping your home for sale. For the most professional and knowledgeable realtors in the area, contact The Degnan Group at Key Realty.